Just open up the den and it springs into shape, ready to be decorated and crawled into to enjoy a cosy, welcoming space. Easy to assemble and pack away. This den can be decorated in various ways to make a lovely environment. Mini: 72 x 90 x 67cm. Medium: 90 x 125 x 75cm. Children love to be in their own bespoke spaces. They can select different materials to drape over the structure. Try sparkly materials for a glittery cave or metallics for a space theme. 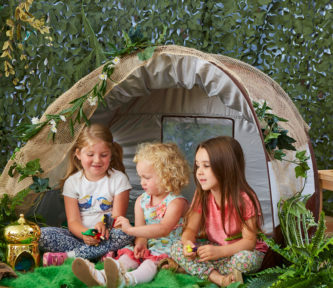 Use the den to create a little hideaway. It can also can be used to divide areas. A truly versatile resource and lovely addition to your setting. Accessories not included.